Heads up Pokémon fans. 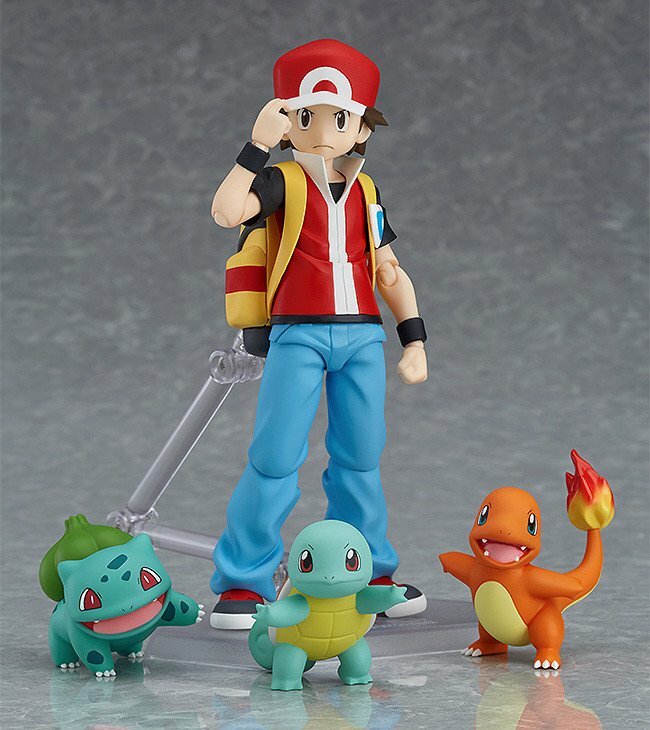 The legendary trainer Red is joining the figma collection. The main character from Pokémon Fire Red, Pokémon Leaf Green and their predecessors has officially joined Good Smile Company’s figma Series. Figma distinguishes itself in the figure-collecting space by creating figures that are highly poseable through the use of “figma joints”. These joints are made from flexible plastic and are located in specific areas on the character to maintain proportions exact as possible. These figures even come with extra pieces allowing you to customize even further. Red comes with two face plates; a standard determined look as well as a shouting battle expression. Along with these two face plates comes other accessories; including the three original starter Pokémon (Bulbasaur, Charmander, and Squirtle), a pokéball, and a backpack. The figma also includes a stand, as well as an articulated arm to allow the owner to place Red in many different dynamic poses. If purchased from a Good Smile Company distributor, a winking Pikachu figure will be included as a bonus. The figma Series are an excellent place for those looking to start a collection of anime-related memorabilia as they are well known for their excellent quality at a reasonable price. Pre-orders for Red run from June 13, 2017 until August 3, 2017 with a release window of December 2017.